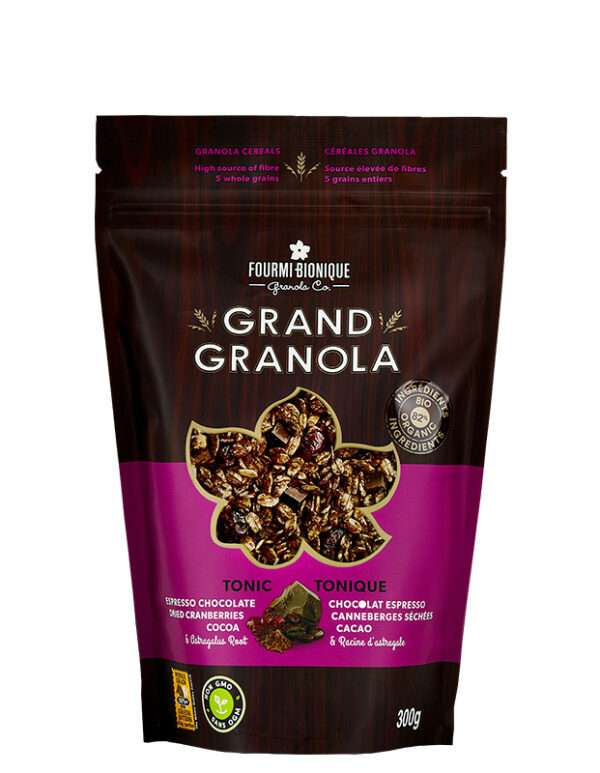 Grand Granola Tonic is a stimulating granola blend made with organic cereals from Quebec. With notes of bitterness and acidity, it features the depth of cocoa and coffee with the toning properties of Astragalus. Then the fruity notes of dark chocolate with organic and fair-trade coffee and Quebec cranberries express themselves… a unique experience for the senses. To reach its full potential, this cocoa flavoured blend can be enjoyed with a plain yoghurt to which banana slices are added for a little sweetness or red fruits to accentuate the acidulous notes. See our creative recipes for baking ideas with granola. This product is certified by Ecocert Canada for it’s organic ingredients, Kosher Dairy by COR, and Whole Grains by the Whole Grain Council. The Grand Granola Tonic is also available in an economic and recyclable bulk packaging. 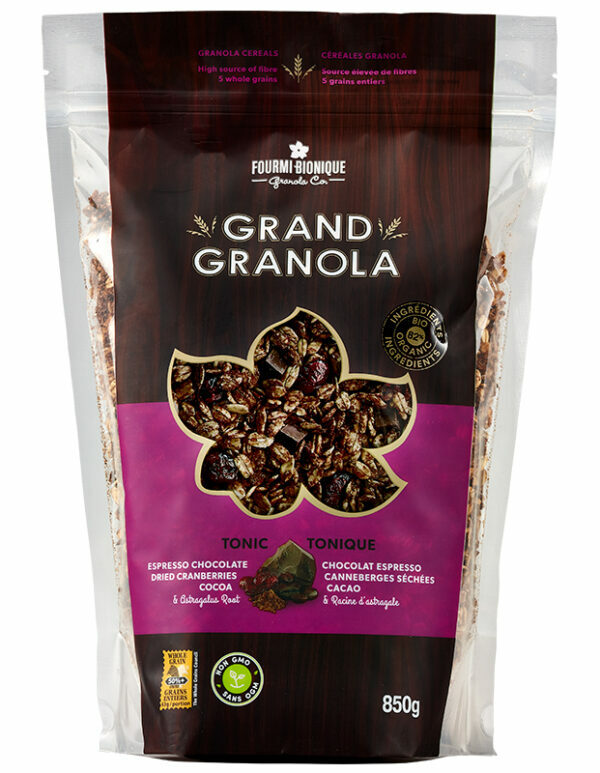 It is also offered in the NUTBROWN grain-free and gluten free granola range. Rolled oats*°, Sugars (honey°, cane sugar*), Whole spelt flour*°, Sunflower oil and/or Canola oil, Rolled barley*°, Rolled rye*°, Dark chocolate with coffee*¹ (cocoa mass*¹, cane sugar*¹, cocoa butter*¹, whole cane sugar*¹, coffee*¹, ground vanilla bean*¹), Dried cranberries° (cranberries°, sugar, sunflower oil), Oat bran*°, Tamari*(water, soybeans*, wheat*, salt), Cocoa powder*¹, Coconut*, Sesame seeds*, Flax seeds*, Astragalus root powder*. May contain almonds, cashews, macadamia nuts, hazelnuts, pecans, milk and ingredients made in a facility that processes peanuts. The rich bitterness of cocoa plays host to the acidic hints of the espresso chocolate and the dried cranberries. Strong and imposing like the autumn wind blowing in the leaves.